Compatible with the KX-TAW, KX-TDA, KX-TDE, and KX-NCP IP PBX Panasonic Communications Systems. 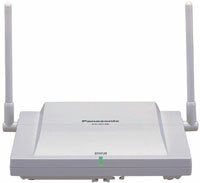 KX-T0155 and the KX-T0158 use the latest technology from Panasonic designed for less interference with wireless networks systems and other cordless phones. Using a 1.9 MHz frequency, this spectrum has less interference with current 900 MHz, 2.4 GHz and 5.4 GHz bands. The KX-T0155 and the KX-T0158 replaces the KX-T0151 model. The KX-T0155 provides 2 communication channels for Panasonic handsets. The KX-T0158 provides 8 communication channels for Panasonic handsets. Each cell station can only handle up to 2 or 8 simultaneous phone calls depending on model used. For systems with multiple handsets, we recommend adding additional cell stations for improved performance when answering calls. The cell stations should be positioned at least 10 feet apart. In most setups, cell stations should be placed approx 75 feet from each other creating overlapping cell coverage. One cell station has approx 150 feet in radius coverage. The cell station are powered by the control unit and do not require an AC adaptor or power supply to work.